These pumpkin chocolate chip muffins are a nice snack or treat when company comes over! 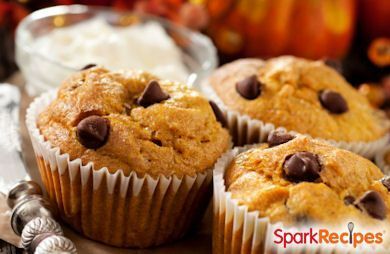 These pumpkin chocolate chip muffins are a nice snack or treat when company comes over! Preheat oven to 400 degrees F. Spray muffin pan with non-stick spray or use paper liners. Mix sugar, oil, eggs, pumpking and water until smooth. In a separate bowl mix flour, soda, powder, spices and salt. Combine wet and dry ingredients until smooth - stir in chocolate chips. Fill muffin cups 2/3 with batter. Bake at 400 20-25 minutes. I cut the sugar down to 1 cup, substituted 1/3 cup applesauce for the oil, used egg white substitute in place of the eggs, and about half the chocolate chips. It made 24 muffins at about 130 calories each. They're super moist and sooo delicious! I sub'd 2 eggs/2 whites for the 4 eggs, and applesauce instead of oil. These were pretty good, but I think next time I'll use white chocolate chips...I think the flavor would go better with the pumpkin and spice instead of the chocolate chips...Just my preference!